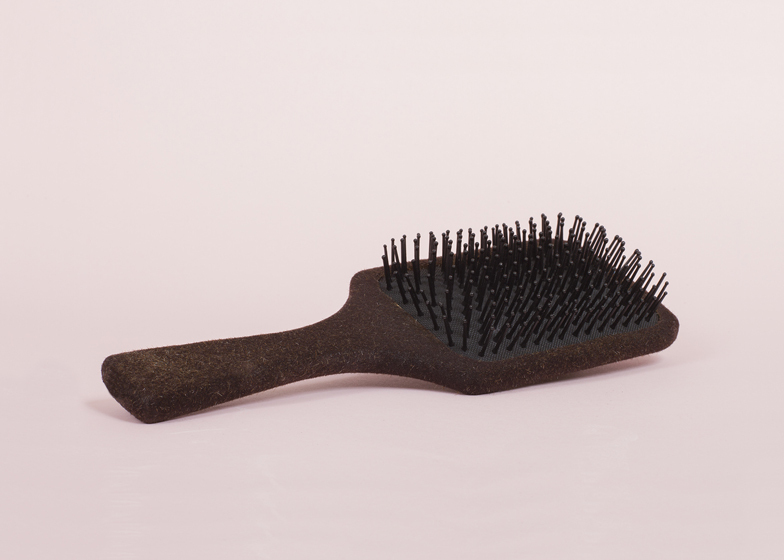 Designers Jack Beveridge and Lizzie Reid have adapted the flocking process to make a hairbrush that's coated in human hair. Flocking involves depositing small fibrous particles onto a surface to make it fuzzy, and Beveridge and Reid cut-up discarded hair to coat the brush. "Using the off-cuts of human hair from our local hairdresser, we cut the hair down to a length that could be put through an electromagnetic flocking gun," says Beveridge. The back and handle were smeared with adhesive, then the hair particles were negatively charged in the gun so they stuck to the earthed brush when fired. We've featured a few stories about strange uses of hair, including clumps utilised as the stuffing for plastic pouffes and strands bound in resin to form spectacle frames. Recently we published a pair of tweezers made from a single loop of metal and we've previously written about shaving brushes with long locks of hair instead of bristles.